Have you noticed something odd about the Bible? It makes no reference to the existence of the ‘Bible’ … and yet it exists. Yes and no. Although Catholicism and Protestantism are united in their belief in the Holy Trinity, sacred scripture doesn’t directly reference the term, just as it doesn’t directly reference the term “Immaculate Conception” in describing Mary. “I commend you because you remember me in everything and maintain the traditions even as I have delivered them to you”. In other words, Christian Truth is conveyed by Tradition, “either by WORD OF MOUTH or by LETTER [that is, written word, aka the Bible or Sacred Scripture]. And how is that to be accomplished? Through Sacred Tradition and written scripture (which wasn’t formalized until the 4th century). Christ is with us always through the Holy Spirit who infallibly guides His Bride, the Church, through the office of Peter’s direct successors. It took 4 centuries before the doctrine of the Holy Trinity was formalized by the Church, and it took 18 centuries before the doctrine of Mary’s Immaculate Conception was formally recognized by Pope Pius IX in 1854. So Mary was the new ark of the covenant. She was the One honored to carry the Word. “Since this term is in the perfect tense, it indicates a perfection of grace that is both intensive and extensive. This means that the grace Mary enjoyed was not a result of the angel’s visit, and was not only as “full” or strong or complete as possible at any given time, but it extended over the whole of her life, from conception onward. The only way to crush the serpent’s head was to be sinless, so this passage can’t refer only to Eve, who colluded with the serpent. 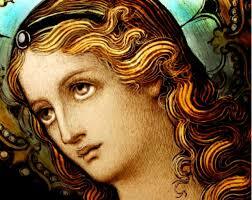 It also refers to the new Eve, Mary, who was full of Grace, and who, unlike Eve, said YES to God where Eve said NO. Eve’s offspring, Cain, Abel, and Seth, didn’t crush the serpent’s head; but Mary’s did: Jesus. So this Genesis passage surely refers to Mary, too. The Bible never said that Sacred Scripture was the only source of determining theological Truth. But it does say that Sacred Tradition is also such a source. Nonetheless, the Bible is peppered with clue after clue of the Immaculate Conception, which the Holy Spirit revealed to mankind over time. Does the Immaculate Conception still have you scratching your head? My recent posts on the subject have generated some good reactions, even if many of my Protestant readers remain dubious. Here’s an outstanding, and brief, video on the subject by the always entertaining Fr. Mike Schmidt.